This week the blog has been sponsored by Ligonier and Reformation Trust. How did we get the five points of Calvinism? 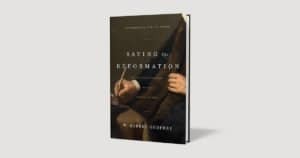 In his soon-to-be-released book, Saving the Reformation, W. Robert Godfrey takes us back four hundred years to the Synod of Dort, which countered five theological errors with these God-glorifying truths. Ten Free Stuff Fridays winners will receive the hardcover edition from Ligonier Ministries and Reformation Trust.